The quantity of organic molecules discovered on Mars is not entirely explained by the hypothesis of cosmic dust: here is a new study. 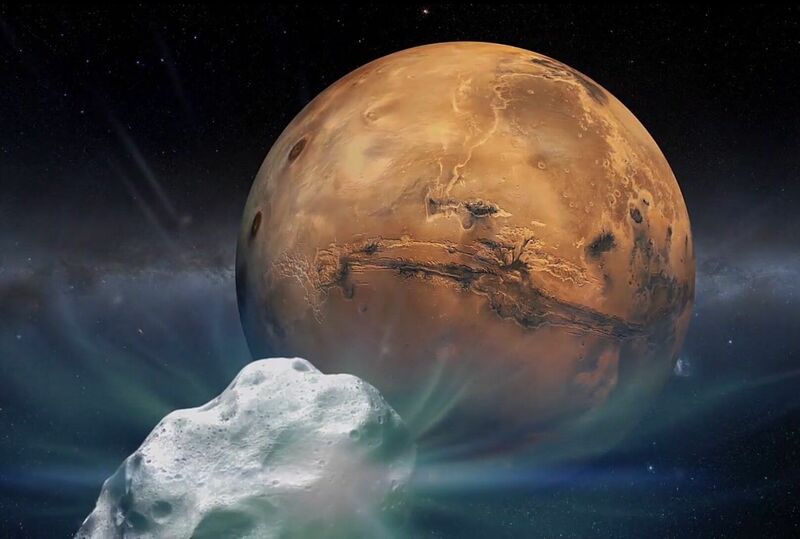 Asteroids and comets may have played a more important role than what was thought to supply Mars with organic molecules (the basics of life). So far, astronomers believed that the organic traces found on the Red Planet, even from the Curiosity rover , originated, in prevalence, from dust particles coming from Space. But now some simulations conducted on the basis of data available from an international team of researchers suggests that at least one third of the detected organic material must come from asteroids and comets: the study is published in Icarus . The research starts in 2015, as the Curiosity perforator brought to light some organic molecules . The scientists wondered how they ended up on Mars : to explain them, it was assumed precisely that they were linked to interplanetary dust particles (which are in fact found everywhere, even on our planet). TRUCKS OF ORGANIC MATERIAL … A team of researchers from SRON and the universities of Groningen, Utrecht and California have worked on a different hypothesis, able to explain also the large amount of organic material present on Mars (and not justifiable with the only powders). Thus the idea was born that transporters could also be asteroids and comets. To test the hypothesis, they planned a model of the Solar System comprising hundreds of thousands of asteroids and comets and experimented it with Peregrine , the supercomputer of the University of Groningen, to verify the number of asteroids and comets that can be fallen on the Red Planet. The calculations showed that 192 tons of carbon per year end up on average on the surface of Mars, a comparable material quantity that can transport eight to ten trucks. Of these carbon trucks, 67% should come from interplanetary dust particles, while the difference is delivered by asteroids (26%) and comets (7%). VERY CLOSE AND VERY FAR. The conclusions of the research (which is purely theoretical) are important for the Martian missions, current and future. According to the scientists, the rovers should closely explore the impact craters of the asteroids: it is in those areas that it is more likely to find important amounts of organic material. The study also has implications on the search for traces of life on exoplanets: Kateryna Frantseva (of the team) explains that “even near other stars and planetary systems there are asteroids and comets that can rain large amounts of carbon on those distant planets, and if they also carry water here we have the perfect foundation for life “.